It’s 7:00 am and I just realized I forgot to pick up the juice boxes for my son’s classroom party, which is a problem because I need to get to work in an hour because there are 176 unanswered emails on my Blackberry, 30 of which are probably from my boss, and I haven’t even showered yet which wouldn’t be such a big deal but I haven’t washed my hair in four days because I’ve been so preoccupied with the presentation I have to give next week, and don’t even get me started on my daughter’s birthday party on Saturday which I’m pretending isn’t happening even though every single one of the 22 kindergarteners we invited is coming and…why is my cell phone in my six-year-old’s lunchbox? You get the point, right? I understand the impulse. It’s resonant and relatable and I have written some version of that paragraph dozens of times — on this blog and elsewhere. In fact, when I logged on this morning to write this post, that’s how I wanted to frame the fact that it’s the holidays and yet somehow have not sat down for a family dinner once in six nights. (And the next few nights don’t look so promising either.) I was going to talk all about my 36-hour whirlwind business trip to Austin; about the panel discussion I needed to prepare for which translated to dinner-from-the-freezer two nights in a row; about how I promised the girls I’d make them gingerbread cookies, so made the dough on Saturday, placed it in the freezer to chill for an hour, and, yet seven days later, there it sits, still chilling. You promised! One of my daughters shouted into the phone on Wednesday night, as I worked through my missed train home. “I’m sorry. We’ll do it later this week, I promise.” When I get home, the vintage gingerbread man cookie cutter I picked up in Austin in a fit of optimism sits on the counter taunting me. My life! So messy and chaotic! So incredibly rich with mess and chaos. The news from Newtown redefines breathless. If I learn anything from it, I hope it’s to remember what matters. Preheat oven to 350°F. Roll out dough on a lightly floured surface until it’s about 1/4-inch thick. 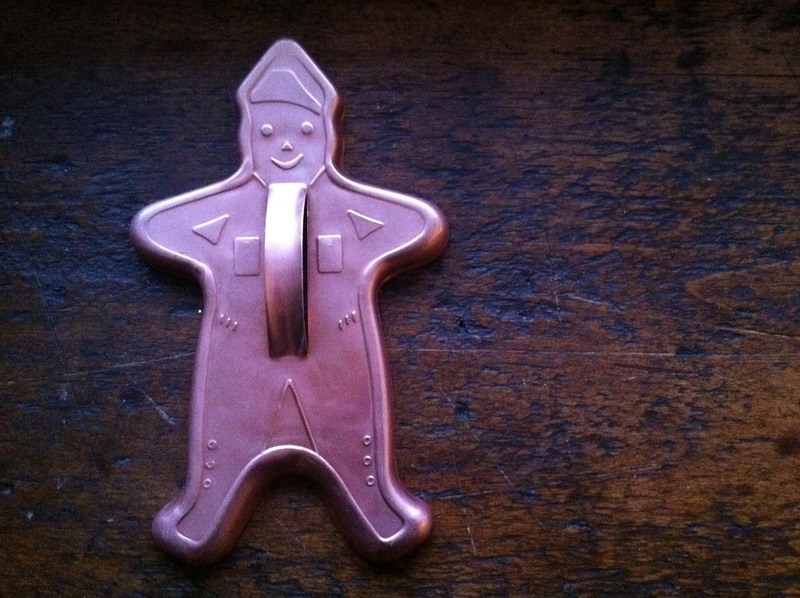 Cut into gingerbread men with gingerbread-shaped cookie cutter. Place on baking sheets lined with parchment paper, and refrigerate until firm, about 15 minutes. Bake cookies 12 to 14 minutes, keeping an eye on them to make sure they don’t burn. Breathless is the word for it. Between household projects, a funeral, and a two-month old, Christmas activities and quality family time have been pushed aside. After hearing the news today, I picked my son up from pre-school, hugged him as tight as he would let me, and he, his brother, and I made cookies. I’ve never been so grateful to have to wash powdered sugar from my sons’ hands and clothes. So true-all of it. A few weeks ago, I stopped saying how “busy” everything was going to be and now just shrug my shoulders and say, “It’ll all get done…it always does.” It may mean some late nights, and don’t even get me started on dinners lately, but it’s the fun-chaos of the season, so it’s nice to just revel in it. Thanks for the great post…as usual. I have that “vintage” cookie cutter in my house. I grew up making cookies with it with my mother. Sadly she has passed on but I will always remember baking and cooking together. Now I can share those same memories with my son. I too often let life and what is important get away from me. My new motto is all is calm, all is bright. It has helped me stay focused on what is most important, and say no to things that don’t meet that criteria. Newtown stopped me in my tracks. Tonight I recommitted myself to calm and bright and finding the calm and bright. “Life is a thump-ripe melon, so sweet and such a mess.” from “Rexroth’s Daughter” by Greg Brown. It’s so hard to remember the sweetness buried in the mess, but so, so important! Thank you! I think you meant “bake until firm.”. I just discovered your blog and while scrolling through I saw the picture at the top of this post. I have that exact same cookie cutter! It was passed down to me from my mom. And yes Life is a whirlwind! I have more respect than ever for my friends that work full time since I started working part time just before the holidays. It is amazing how much we as moms try to fit into a day!